**CD and download, includes 6.5 hours of music** "Compressions & Rarefactions is the fourth solo release on 12k from New Yorker Kenneth Kirschner, who is widely known for epic-length compositions that challenge the forms of modern composition. The album is released as a single CD with a digital download of over five hours of additional music that couldn't be realized within the time constraints of the CD format. 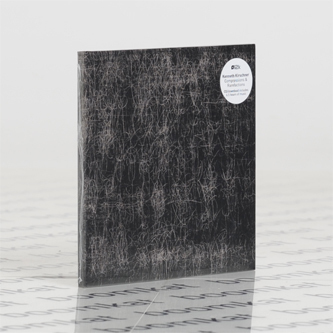 Also included is a booklet of essays on Kirschner's music from Marc Weidenbaum (Disquiet), Simon Cummings (5 Against 4), Mike Lazarev (Headphone Commute) and renowned visual artist Kysa Johnson, who was also responsible for the album's artwork. Kirschner's title, Compressions & Rarefactions, refers most directly to the physics of sound: the pressure waves in air that are the physical component underlying what we perceive as sound. This concept finds an evocative parallel in the art by Johnson, whose work is about visualizing the imperceptibly tiny physical phenomena that make up everything around us. The title can also be related to the compositions themselves: this is music that alternates between extreme density and extreme sparsity, using those contrasts as a major expressive element as they alternate like waves of pressure and absence in air. Finally, the title also evokes the very long durations of several of the pieces on the album, including two that stretch to over two hours in length. Kirschner's music is often described as "challenging," and certainly he has a unique voice among his peers and throughout the extended genres of his sound. His work tends to hover precariously between the worlds of electronic music and chamber music, likely due to his influences from the worlds of modern classical music, philosophy and science fiction. This can be seen quite clearly in two of the album's tracks, "September 13, 2012" and "January 10, 2012," which use what appear to be small ensembles of classical acoustic instruments, but which are actually electronically realized - thus allowing both subtle and radical alterations that aren't possible with traditional instrumentation. These pieces in particular focus strongly on microtonality, twisting and bending the apparently acoustic instruments into tunings that wouldn't be feasible in a conventional performance. Harkening back to territory Kirschner explored on his previous album Twenty Ten (12k1066, 2011), "April 16, 2013" uses tuned percussion instruments (bells, glockenspiels, xylophones) played with constantly shifting, irregular meters, while "July 17, 2010" is made up entirely of sounds derived from everyday kitchen drinking glasses. These tracks are dense and highly intricate, showcasing what can be seen as a rare "beautiful" face of Kirschner's music. The percussion cascades and shimmers, like falling water, in highly melodious layers and webs. The final piece, "October 13, 2012," is composed entirely with viola, played by Tawnya Popoff, under the direction of Kirschner. Her performances are layered and processed to create a sort of "polyphonic viola," allowing for much greater harmonic complexity than could be achieved with just a single instrument. This piece, in a quite characteristic style for Kirschner, is founded on silence and repetition, and cements the "compressions & rarefactions" concept with swelling chords of viola that seem to end with a dissipation of air into silence that awaits the next wave of sound. This style has become a trademark for Kirschner, in which extended listening and concentration pay off in what ultimately becomes a highly meditative and unexpectedly serene epic. Compressions & Rarefactions sees Kenneth Kirschner further prove why he is one of the most important figures working in highly composed and conceived serious music that blurs the lines between technology and modern composition. He creates a new "classical" blueprint and is one of the true 21st century composers pushing the boundaries set by the 20th century masters such as Feldman and Pärt."